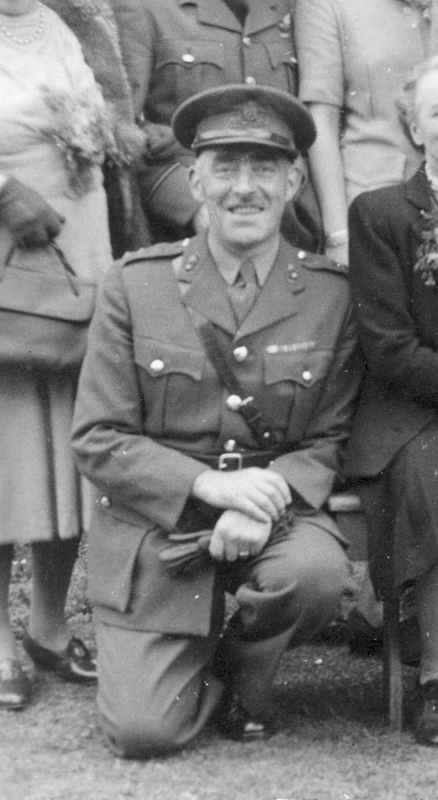 Major Walter Cox, pictured by Fleming's Bridge, Bottesford, c.1950. 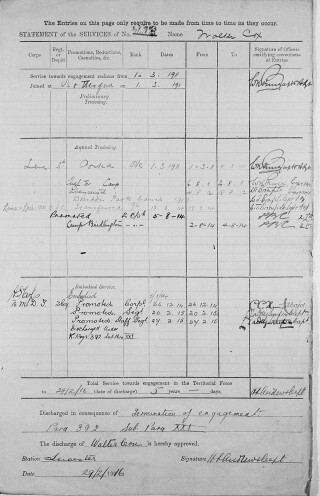 Walter Cox WW1 service record sheet including end of his engagement with the army in 1916. Walter Cox pictured in a group photograph taken on the Rectory lawn during World War 2, probably about 1945. Walter Cox is one of the three brothers, Clifford, Walter and Albert Cox, who all appear in the Bottesford ‘church organ’ list of WW1 service men. Walter Cox was born in 1892 in Bottesford, son of Henry and Mary Ann Cox. Henry Cox, a railway signalman, was born in 1858, at Hitchin, Hertfordshire, Mary Ann Cox was born in 1857, in Nottingham. There were six sons and one daughter in the Cox family: Harry (born 1881, died 1894), Sidney (born 1883), Clifford (born 1885), Leonard (born 1889, died 1890), Walter (born 1892), Albert (born 1898) and Lilian (born in 1894). In 1891 the Cox family lived in the New Railway cottages. In 1901, Henry was still a railway signalman and the family lived on the High Street, Bottesford, close to the corner of High Street and The Nook (Pinfold Lane). Walter Cox was awarded a County Junior Scholarship in 1904, having come 14th in the county. In 1911, he was still at the family home, now on Elton Road (Nottingham Road), Bottesford. He was employed as a teacher at Bottesford School by the Grantham Education Committee. The household at this time also included his sister Lilian (a milliner), and schoolboy Albert. 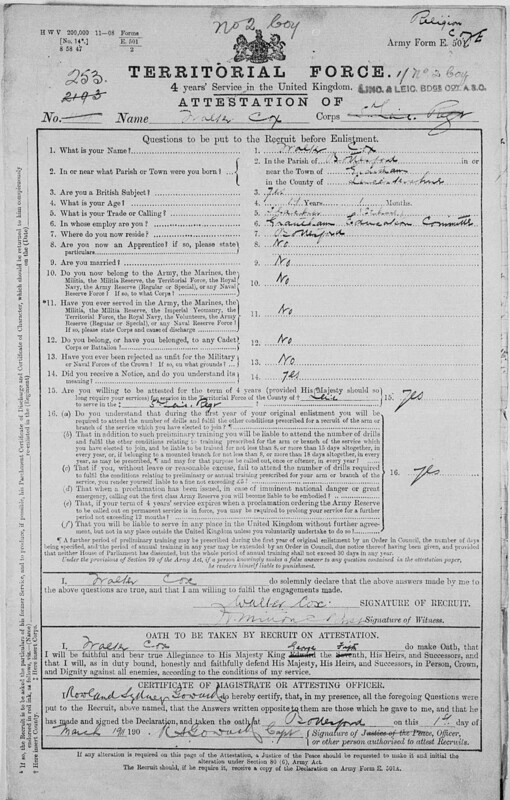 Walter Cox’s attestation paper dates from the 1st March, 1911, when he was 19 yrs 1 month old. He enlisted as Service No.253, initially with the ASC (Army Service Corps) in the Territorials. However, he was assigned to the 5th Battalion of the Leicestershire Regiment three months later. He attended training camps in the UK from 1911 to 1914, and was at camp at Bridlington at the outbreak of war. He arrived in France on the 5th March, 2015. He was promoted to Corporal on the 26th December, 1914, before leaving for France, and then achieved rapid promotion to Staff Sergeant: Sergeant on the 20th February, 1915; Staff Sergeant on the 27th February, 1915. However, he left France on the 15th February, 1916, and the army on the 29th February, 1916, on “Termination of Engagement”, completion of the five years he had originally signed up for. 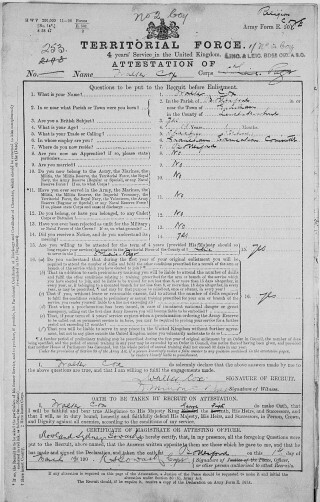 However, it appears that he was conscripted back into to the army, and was commissioned in the RA (Royal Artillery) until March 1919. During this spell of service, he was promoted to 2nd-Lieutenant with the RFA (Royal Field Artillery). Walter Cox was awarded the 1914/15 Star, British War Medal and the Victory Medal. 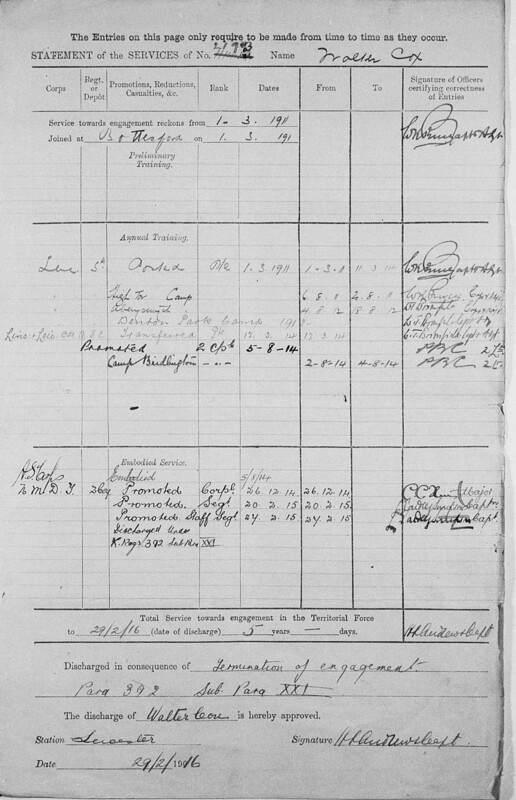 He is recorded in the NUT War Record list of union members who fought during the war. He returned to teaching and was head teacher at Redmile School for three years, then at a school in Coalville for the same amount of time before he came back to Bottesford, in October 1927. By the 1930s had become the well-respected head master of Bottesford village school, known affectionately as “Boss Cox”. Walter Cox rejoined the army during WW2, even though he was well into his forties. He resigned from the school headship in 1940, to return to the army. In September, 1940, he served as a captain in the Royal Artillery. He resigned finally from the headship at Bottesford School in March, 1946, and took up a post with the Allied Military Control Commission in Germany. 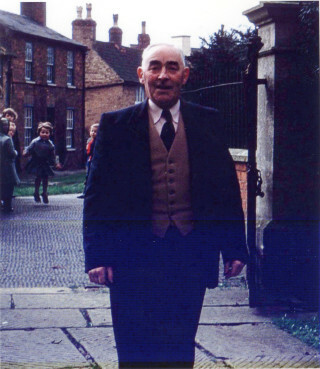 He had originally been a pupil teacher at Bottesford School, and had been associated with the school as a professional teacher for the nineteen years, since 1927. After WW2, he continued to sing in the church choir, and was a churchwarden. Mr George Waudby recalled that in 1935, Walter Cox purchased a new ultra-modern Citroen car. This model was to become very popular with the French and German police during World War 2 (Bottesford’s Motor World). Mr Waudby also pointed out that Walter Cox has the rare distinction of having a street named after him, Cox Drive, in Bottesford (Bottesford School Memories). After he had retired from his full-time post, he continued as a relief teacher and also spent time working at Whatton Detention Centre. He was married for fifty seven years, and died on the 28th September, 1973, aged 81. During the 1920s, the Coxes had lived on Main Street, Redmile, and then by 1928 on Chapel Street, Bottesford. After 1930 they moved to 20, Belvoir Road, Bottesford, where they lived for many years until, after his wife had died and in fact only one month before he died, Walter Cox moved to a bungalow on Granby Drive. Walter Cox got married late in 1916, after leaving the army, to Hilda May (Medora) Simpson, who was born on 21st May, 1892, and died early in 1974. He is still remembered in Bottesford as “Major Cox”. Served in WW1 and again in WW2, attaining rank of Major.